"Pictures do not do these custom coins justice. They are stunning and we highly recommend them." 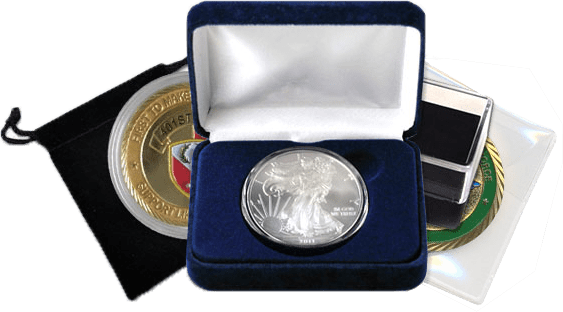 Protect and present your custom coins with a selection of our great package options! Who says custom coins have to be round in shape? When you’re shopping for custom made coins, you want the best. We understand. 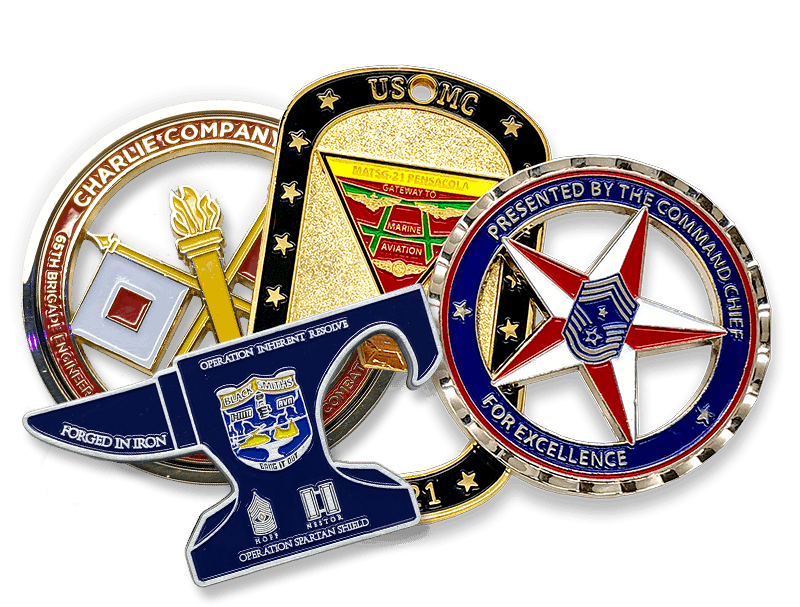 Our mission is to provide the finest challenge coins you can buy, at prices that can’t be beat. We’re also committed to providing you with the finest customer service experience you’ve ever had. We never charge for artwork or revisions, so you can craft the design of your custom coins exactly the way you want it. We’ll make your custom medal coins or medallions to your exact specifications. We’re not satisfied until you’re satisfied. Customer satisfaction is the key to our business success, and your order is as important to us as it is to you. That’s why we back everything we sell with our 100 percent satisfaction guarantee. And when we say "custom challenge coins," we mean just that. We can design your custom coins in virtually any shape or size. Get creative! Our talented artists will be happy to help you create a unique design that’s perfect for your organization’s needs. Ordering commemorative custom coins from The-Coin-Factory.com is a breeze! Just give us a call or fill out our free quote form. Not sure what you want? No problem. Our talented graphic artists will help you craft a design of custom engraved coins that you can be proud of. And remember, our artwork and revisions are free. We’ll email you a proof of your design. All you have to do is email us back your approval, and we’ll get started. Two weeks later, your custom challenge coins will be delivered to your door, individually bagged. What could be easier? Our minimum order is only 100 custom made coins. As the quantity goes up, the price goes down. For orders of more than 300 coins, we don’t charge any mold fee. But that doesn’t mean we don’t value smaller orders too. We offer the same outstanding service on every order, no matter how large or small. The-Coin-Factory.com doesn’t want your business just once – we want to win you as a customer for life. We stake our reputation on our products and our service. To really make your custom coins unique, we offer a selection of options, including your choice of metal styles. Select from gold, silver, copper brass, black nickel or duotone styles. You can select polished or antiqued finishes. Other available options include die cut edges, epoxy coatings, sequential numbering, and additional colors on one or both sides of your coins. We even offer a range of packaging choices for your custom medal coins. Select from the standard PVC pouch, velvet bag, acrylic case, coin capsule or velvet box. Design the perfect presentation for your recipients. Ready to order? Have a question? Give us a call! We’ll be happy to answer any questions you might have before you order. Remember, at The-Coin-Factory.com, artwork, revisions and shipping (within the U.S.) are always free. 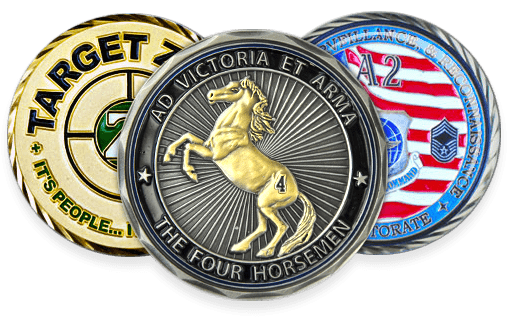 Call us toll-free at 1 (877) 870-5463, fill out our free quote form, or email us at [email protected] We’ll answer your questions about custom made coins promptly and get your unique challenge coins on their way to you!